SAAT 2019: The SAAT is the Siksha ‘O’ Anusandha Admisison Test. The Siksha ‘O’ Anusandhan is the deemed to be university being located in Odisha. The university offers various courses of medical, management, engineering and technology. Latest Update: SAAT 2019 Admit Card Released!! Follow the below-given link and download your admit card. Latest Update: SAAT 2019 Registration Last Date Extended till 29th April. Check the new schedule below. Latest Update: SAAT 2019 Registration and Application Filling process is started now. Check the Procedure below. Latest Update: SAAT 2019 Schedule Announced!! Check the Table Below. The students who want to know the method of selection can get it for sure through appearing in the SAAT Entrance Exam 2019. However, admissions through SAAT are only for Engineering, Science, Management and Pharmacy Streams. Here we are updating all aspirants with the best information on how to apply SAAT Online Application Form, dates important for different events, exam pattern, and syllabus concluding all other pre and post examination details that are important. The information shared here will be important for all those who are interested in pursuing the exam. In order to pursue dreams, it is essential that aspirants also match up and fulfill the SAAT Eligibility Criteria. Those who are willing to pursue it irrespective of their education (CBSE/IB /State boards) can check out details given here, in tabular form each. 10+2 or equivalent examination with Physics and Mathematics as compulsory subjects with Chemistry / Computer Science / Information Technology /Biotechnology / Biology / Informatics / Statistics / Technical Vocational as optional. Note: JEE Mains Qualifiers are exempted from giving the entrance exam. 10+2 examination passed the with min. required marks in Physics, Chemistry & Biology taken together. M.Tech. Pass/Appearing in B.Tech. or equivalent in the relevant field. The application forms are the first step towards taking admission in the university. The SAAT 2019 Application Form is accepted online only. However, we have made it easier for aspirants to catch up the event as SAAT Apply Online information will be provided to you by us. Moreover one can also easily check out process guidance through the information provided by us. Open the university website soa.ac.in. From the home page find and click on the link to apply online. Fill up your name, email and mobile number in asked fields. Verify the number through received OTP. The login details will be sent to the registered email ID. After OTP verification your login will be created from where using the received credentials one can fill the application form. Recheck the form, submit and download the copy. The exam pattern is the core of complete exam, through proper knowledge of it; the exam can be attempted well. Here we are providing you the SAAT 2019 Exam Pattern through which learning will be easier. Sections/Subjects: As per requirement of the specification required in each course. Marking Scheme: For every correct answer 4 marks will be awarded and 1 mark will be deducted for every wrong answer. 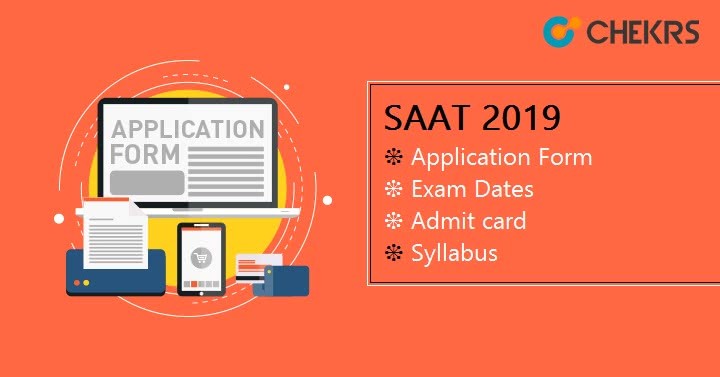 The SAAT 2019 Syllabus is crucial for each candidate who is looking forward to securing admission with the best score in the exam. Here we are providing updates through which one can easily understand the major topics that have to be studied. However, those who are trying to know the source for SAAT Exam Syllabus, it can be accessed easily through the direct link provided by us. Moreover, studies can also be initiated through the pdf provided by us, which is given at the end of the post. Admit Card is the most crucial document as it will contain the name, photograph, program, subject, the address of the exam center, allotted and complete test schedule. The SAAT Hall Ticket Download is online only. The availability for download can be facilitated to candidates through direct link provided by us. Moreover, the SAAT Admit Card Date will be also be notified to your earliest. Also, it is advisable to all candidates to preserve the admit card till the admission process is over. Link will be present there to download the admit card. Click on the given link. Enter Username & Password and click on Login button. Admit Card will appear on the screen, download it and take the print of it for future references. The SAAT Exam Result 2019 announcement of qualified candidates is done through the merit list. However, the candidates are informed that merit list announcement will be done separately for each course. Also, separate merit lists will also be drawn for candidates qualifying under each reservation category. Those who will qualify the exam will be given a rank card. The SAAT Result Date, as well as its downloading, can be accessed through updates given with subscription. Two sets of photocopies of the above documents. 2 color passport size photograph. The SAAT Counselling Dates will be uploaded by us and notified to you once the university announces it.